Audio not sensitive enough to hear every newborn sound. If you’re expecting a baby you might not know this already, but once your baby is born, your time will compress dramatically. Because you always have to keep an eye on your infant, the other chores you need to do around the house will take a lot more time with the frequent interruptions. Besides the obvious advantage of video monitors, the DXR-8 is the first ever monitor to come with interchangeable lenses. They’re really easy to use, just like you would use different lenses with a digital camera. 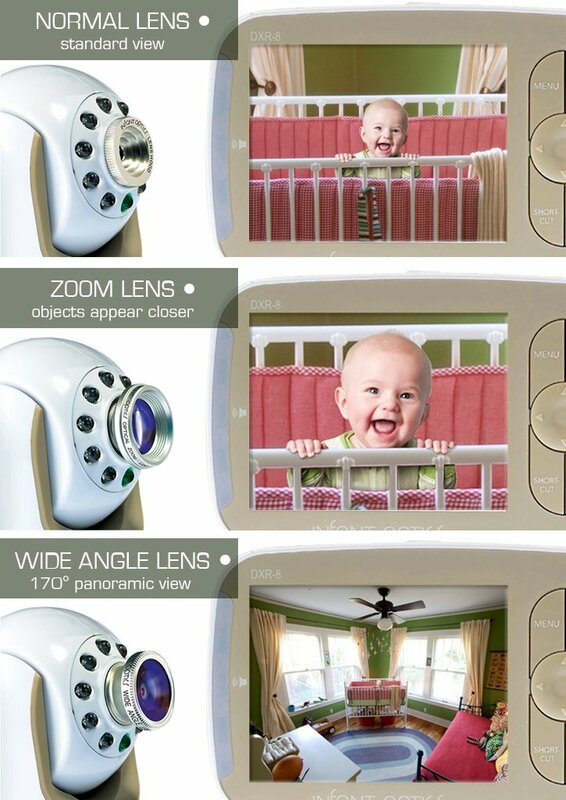 They enable you to have a close or panoramic view. This is really amazing, and is probably by far the greatest benefit you get with this monitor. You’ll be able to use it until you don’t need to keep an eye on your kid anymore. We believe in value for money. This is a concept that you should apply to anything you buy, and especially to baby products. There are many products that have a short life span, and need to be changed or otherwise upgraded once your baby passes through certain phases of his development. There’s no need to brake the bank when you have a child. You only need to invest in products that are worth their price and can be used and for prolonged periods of time. The Infant Optics DXR-8 is just that kind of product. You will find both lower and higher priced models, but the innovations of this model make it useful for an extended number of years. Built-in 2 way talk, so it’s easy to sooth your baby or talk back to him. Multiple Viewing Angles. Most parents have mentioned that, although they had to get the zoom lens separately, they thought the concept is amazing. Intuitive Menu. One of the most common situations when you get a new gadget is figuring out how it works first. After getting a hang on it, the structure of the user interface will make your life either easy or complicated. This is another aspect that most parents loved about this monitor. They say that it’s very easy to pan, tilt, and change settings. Range. This is another aspect that many reviewers have noticed. One mom said that it was the picture and sound was great even with 2 stories between them and the baby, and even when she went out in front of the house with the dog. Although most parents loved this monitor, there were some reviewers that mentioned some weaknesses that they encountered. One of the most cons that some customers noted was a weakening of the signal through thick walls. Another aspect that many customers mentioned is the fact that they had to buy the zoom lens additionally. It would have been nice if they included the zoom lens in the package as well. So if you need it, make sure to add on that item when you check out. 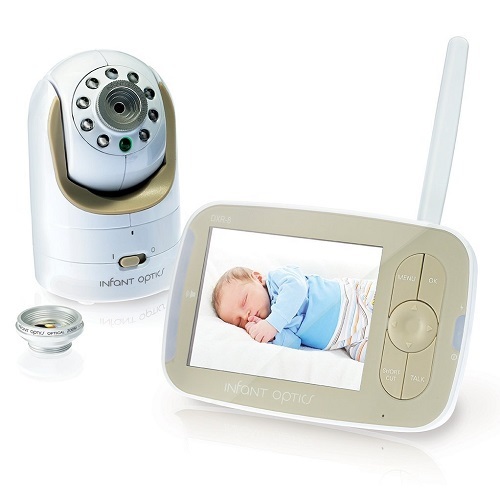 Overall, although the Infant Optics DXR-8 Baby Monitor has some weaknesses, it’s truly a great investment, considering the many advantages that come with it. Even if you think that another monitor might be better suited fr your needs, make this purchase before your baby arrives, because afterwards you’re more likely to make a wrong choice. If you think the Infant Optics DXR-8 will fit your needs best, take advantage of this limited time discount right now!